Archaeological Data in the GIS Portal of the National Heritage Board of Poland. Oniszczuk and Makowska. Internet Archaeol. 43. The National Heritage Board of Poland (NHBP) is a state agency established by the Minister of Culture and National Heritage. In the decentralised system of heritage management in Poland, comprising sixteen Voivodeship Monuments Protection Offices (See Box) with rather theoretical supervision of the Ministry, it is the only central organisation dealing with heritage in all its forms. The main objective of the NHBP is to implement the State's policy concerning the protection of cultural heritage and preserve it for future generations in accordance with the strategy for sustainable development. Thus, the Board gathers and disseminates knowledge on heritage, sets standards for its protection and conservation, and works to increase social awareness of the value of Polish cultural heritage (http://www.nid.pl). The Board also keeps the documentation of the register and the record of monuments (see section 3). With regard to digitisation, the NHBP has been the Centre of Competence in digitisation of monuments since 2009 (Sejm Rzeczpospolitej Polskiej 2010, 39). As such, the Board's objective is to implement technological changes in digitisation and digital data storage, coordinate data gathering and storage, and share the digital content (Anon 2009, 49). We would like to describe here a digitisation project of the NHBP initiated in 2010, resulting directly from the INSPIRE directive. The course of the project, seen from an archaeological perspective, is the focus of our article. The INSPIRE directive was the starting point for the creation of a monuments database and the map portal of the National Heritage Board of Poland. The Directive 2007/2/EC of the European Parliament and of the Council of 14 March 2007 establishing an Infrastructure for Spatial Information in the European Community (INSPIRE) came into force in May 2007. According to its provisions, the spatial data infrastructure is to enable environmental spatial information to be shared among public sector organisations and facilitate public access to this information across Europe. The extensive data are to help in informed policy-making across boundaries. The directive is all about efficiency and compatibility of the data. The information should be collected on many levels of detail, and its scope, as well as conditions of the data re-use, should be explicitly formulated and easy to find (see About INSPIRE). On a national level, in Poland the directive was followed by the Act of 4 March 2010 on spatial data infrastructure. According to its provisions the Minister of Culture and National Heritage is responsible for protected sites in the part referring to immovable monuments (Rada Ministrów 2010, Art. 3, par. 7, pt c). In 2010 the implementation task was assigned to the National Heritage Board of Poland. The entire cultural heritage sector in Poland, at least as far as various public bodies are concerned, generally lags behind with digital technologies. It is enough to say that binding regulation on the register of monuments, issued in 2011 (Minister Kultury i Dziedzictwa Narodowego 2011), specifies which colour of ink has to be used to separate entries in the book of the register (black) and which to cross them out (red). The use of green and blue is also specified but, needless to say, a digital version of the register is not. In 2010 our organisation was no different and a large-scale digitisation was regarded as an earthquake. The implementation of the INSPIRE directive was not only about digitising thousands of documents but also about the change in our approach to archives, including the archaeological ones. Until then, access to the documents in our possession was mainly limited to archaeologists (including archaeology students), professionals involved in spatial planning and public developments, and landowners, which was justified with the need to protect archaeological heritage against detectorists. Their number is estimated at about 50,000 people across the country, and the overwhelming majority operate illegally (Makowska et al. 2016). On the other hand, however, there never was any straightforward legal backup to enforce such limitations. Register of monuments includes the most valuable monuments recorded in the register by Voivodeship Monuments Protection Officers. Since 2004 it has been divided into three books: A – for immovable monuments, including architecture, parks and garden, urban and rural spatial layouts, B – for movable ones, and C – for archaeological monuments. Spatial dimension makes 'A' and 'C' suitable for digitisation within the demands of INSPIRE. First entries of archaeological sites into the register were made in 1929, soon after the introduction of the first legal regulations. Thus, the register of archaeological monuments has been created by several generations of monuments protection officers, working under changing laws and changing administrative divisions of the country. In the absence of national guidelines and policies, different, sometimes personal, criteria for the assessment of the value of monuments have been used. The register was also influenced by political reality. In the 1960s and 1970s the work of Voivodeship Monuments Protection Officers was centrally controlled and the number of administrative decisions on the entry of monuments into the register was one of the main quantitative indicators. As a result, over these two decades just over 30% of the sites were inscribed in the register each December, which raises doubts as to the actual value of those sites (Figure 1). According to the data of the National Heritage Board of Poland the current number of registered archaeological sites is 7748 (c.10% of all registered monuments) (see http://www.mapy.zabytek.gov.pl). Pomniki Historii (Monuments of History) can be regarded as the best of the best. They have been recognised by separate ordinances of the President of Poland since 1994. These monuments are of transregional significance, are important for Polish cultural heritage, have great historical, scientific and artistic value, are fixed in the public consciousness, and are the source of inspiration for future generations (see http://www.prezydent.pl/aktualnosci/pomniki-historii/). Currently there are 60 such monuments. Cultural parks are areas protected because of the unique features they possess (cultural landscape with immovable objects characteristic of local traditions). In order to protect them, land use and development within such parks is subject to restrictions. Parks are established by Commune Councils. There are currently 30 cultural parks. Monuments included in the spatial development plans are disclosed by communes obliged to create such plans. There are no specific rules concerning the presentation of the monuments or the transfer of information in this regard to the National Heritage Board of Poland. The National Heritage Board keeps the record of the first two forms of protection, which is why they were the ones to be delivered within INSPIRE. In addition, the Board is a national UNESCO Focal Point, so 14 World Heritage Sites were also added to the list. Having defined the resources to be digitised, we, the NHBP archaeologists, approached the project with two basic premises. INSPIRE 'forced' us to digitise according to very precise demands but we wanted to create a database adjusted to our needs. We were to present only the register of archaeological monuments, but we would prepare tools for eventual presentation of the entire Polish Archaeological Record. To summarise, archaeological heritage management must have come first. The project developed simultaneously in several directions. We had to verify our archive, create the data model compliant with the demands of INSPIRE and prepare the tools for its implementation. The work was not easy, because from the very start heritage experts responsible for all categories of immovable monuments had to find common ground (and a common language) both with the digitisation and the GIS team and each other. The use of reliable, detailed, and up-to-date source data is essential for the creation of European spatial information infrastructure (Bielawski et al. 2013, 144). And not only had our archive not been digitised, it had never even been verified at a national level (Kołodziej 2013, 119). Filling the gaps in the documentation of the register of archaeological monuments lasted throughout the entire scanning phase, which meant that the number of documents to be digitised remained an estimate until the very end of the process. To illustrate the scale of the problem, it is enough to say that during this verification some archaeological heritage inspectors were asked to create digital lists of all registered sites in their voivodeships for the first time. The digitisation itself was carried out with the use of a tool called Scan Manager, designed specifically for our project. It is a web-based application enabling rough geocoding of scanned documents during the creation/editing of metadata. The user simply assigns them to respective units of territorial division of the country (voivodeships, provinces, communes and localities). Metadata describe also the type of document, its author and the date of issue, as well as the number in the register, which allows an easy identification of the monument. A fuller description of the features of the application was given in articles by Arkadiusz Kołodziej, the project manager (Kołodziej 2012, 122-26; Kołodziej 2013, 264-67). This tool is now integrated in the entire system of data management and is used for retrieval of digitised documentation in desktop solutions. It is also accessible online for authorised users. 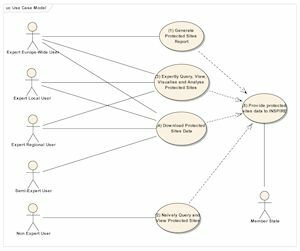 Our data model for the register of archaeological monuments was prepared on the basis of D.2.1.8.9 INSPIRE – Data Specification on Protected Sites – Guidelines version 3.1. A characteristic of a site is described with the set of components: geometry, documentation, general function, specific function, and field verification of the register (Kołodziej 2012, 127-29). The general INSPIRE information about a site is completed with country-specific forms of designation (historical monuments, site number in the Polish Archaeological Record). During the implementation of the INSPIRE regulations, we made a preliminary assumption that on the map we would mark only legally protected areas as shown in graphic annexes attached to almost every administrative decision on entry into the register of monuments. In a perfect situation it would mean the use of polygons accurately reflecting the geometry. The situation, however, is far from perfect, especially in case of older decisions that often do not specify site location at all. Graphic attachments are often informal (not mentioned in the decision, unauthorised by stamp and signature). Sites are sometimes marked only by a cross or a dot. What is more, instead of map fragments or cadastral plans, most annexes are usually simple sketches drawn without scale, with a subjective choice of characteristic elements of landscape, e.g. a slaughterhouse which, 30 or 40 years later, no longer exists. Sometimes the sketch is missing and the site location is described on the basis of the simplest distinctive features, such as a 'ridge' (which might subsequently be levelled), or the 'last house in the village' (that could subsequently be demolished or is no longer the last house). In some voivodeships names of landowners were the most frequently chosen identifier. We therefore have the entire collection of landowners with interesting last names (see the translation below), whose addresses we have to determine in order to locate a site, e.g: 'a site located on the fields of Stephanie Guts and Mary Tootsie, between their houses, north of the road in the eastern part of the village'. That is why we have decided to use compound geometry with polygons, points and lines (in practice the latter are used very rarely). Furthermore, in our system it is obligatory to mark geographical precision as 'accurate', 'approximate' or 'uncertain'. The location of the vast majority of objects is defined as 'approximate'; the percentage of uncertain locations is unfortunately also large. The data are stored in our repository and managed by the computer application for the acquisition of the spatial data (Kołodziej 2012, 124). Owing to outsourcing of the digitisation process, we had to predict all the possible problems in all their variations and prepare digitisation strategies for non-archaeologists. Verification of the work of the digitising company has revealed another crucial issue. The company and its individual employees were paid by the record, and unclear administrative decisions were used to unnecessarily multiply their number (i.e. 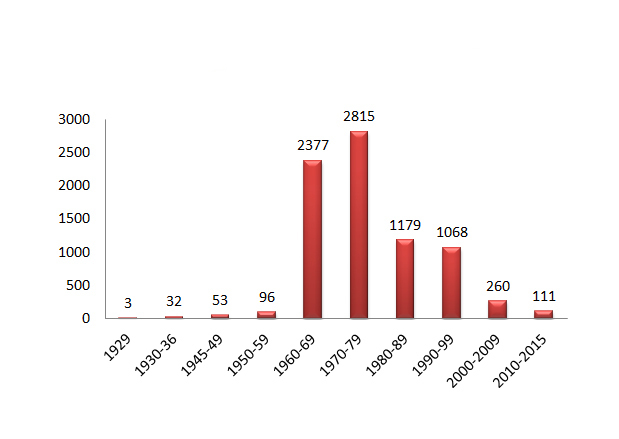 the number of the sites), whereas, obviously, we needed the correct data for heritage management. Documentation scanned using Scan Manager accompany the site record. They are ordered hierarchically and organised around the first decision when entered into the register of monuments, to which the remaining documents (such as official explanation of the decision, instruction for a landowner, contour plan, cadastral plan, hand sketches of the location) are relationally linked (Kołodziej 2012, 124). Values listed in the INSPIRE data specification for protected sites are compliant with the National Monuments Record classification scheme. Nineteen categories do not match Polish terminology for the description of an archaeological site's primary function. If the database was to be of use to archaeological heritage managers in Poland, it had to put the emphasis on actual terminology. For that reason we ascribed the INSPIRE general function to specific entries after the creation of the thesauri (see section 5.4). In order to include the terms used in Poland in the database, we created the Specific function section. It contains information on archaeological cultures, types of site, chronology and settlement phases. The three major hierarchical thesauri we created (archaeological culture – 3 levels, chronology – 2 levels, and site function – 4 levels) use Polish terminology, as well as chronological and cultural divisions. We wanted them to reflect the content of the documentation and not to discuss it; hence, they contain some obsolete or imprecise terms, as they encompass almost 90 years of archaeology and reflect continuous development of science, with cultures 'degraded' to groups or 'promoted' to technocomplexes, groups becoming cultures, etc. For the same reason, no valuation of various coexisting systems of classification was intended and, e.g., the Bronze Age can be described with numbers (I-V), letters (A-D), or as early, older, middle, younger or late. Since 2009 the National Heritage Board of Poland has conducted field verification of the register of archaeological monuments (Figure 2). Its aim is to set the register in order by identifying objects that no longer exist or have lost their value as monuments. Lists of such sites will be delivered to the Minister of Culture and National Heritage, who has the authority to officially remove them from the register. The verification is also to demonstrate which decisions are incomplete or incorrect and do not guarantee adequate protection for monuments. Defining current threats to heritage and the description of their state of preservation is also crucial for establishing a coherent strategy for archaeological heritage management. Activities carried out within the verification project include: analysis of documents concerning specific monuments, archive query, field visits, during which the site questionnaire is completed and photos are taken. Resultant conclusions concerning further heritage management are also based on the latest results of scientific research of the site. The verification data are added to the database using a dedicated application called Smart Client. The application, prepared by the NHBP, is accessible for authorised users and it does not require any additional GIS software. The data we collect include among others: updated information on function and chronology of sites; description of the current state of research; evaluation of the correctness of the territorial range of legal protection given in the administrative decision and the correctness of the decision as a whole; description of the current land use and the state of preservation together with cultural landscape; evaluation whether the entry into the register of monuments was well founded, as well as the resultant conclusions. In the latter we point out what should and should not be done on the site, and suggest additional methods of documentation. Geometric data of sites can also be edited with the Smart Client. New, updated, geometry does not change the limits of legally protected areas, but the NHBP and Monuments Protection Officers will be able to use it for heritage management. The verification data we gather in the system are to enable further analysis and the preparation of the Report on the State of Monuments in 2017, encompassing books A and C of the register (Dąbrowski 2014, 62). The production of the report is part of the National Program of Protection of Monuments and the Guardianship of Monuments for 2014-2017. Its conclusion will serve as the basis for more efficient heritage management. 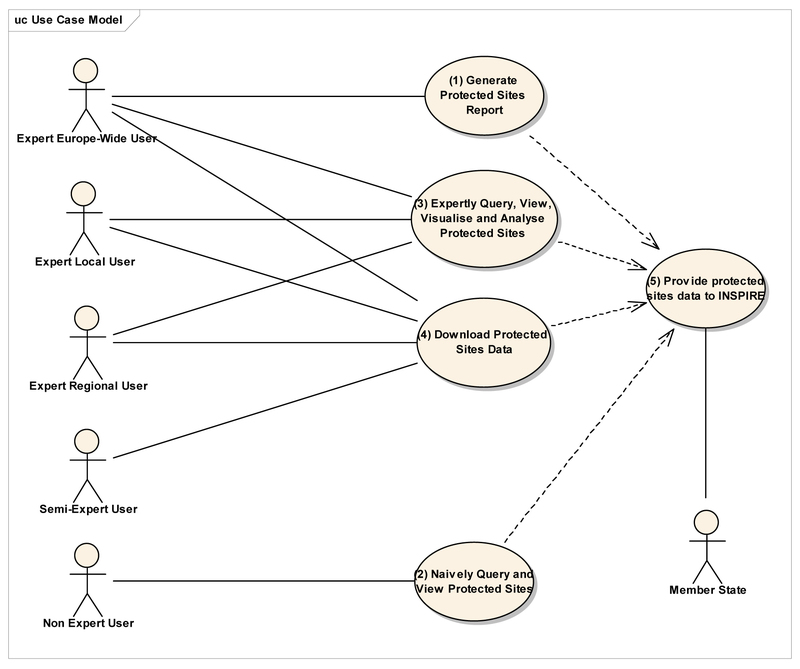 The above data model was implemented with dedicated software using Geomedia Professional 6.1 environment and the Geointegrator (GI3) application by Intergraph (Kołodziej 2012, 127). To summarise, so far the system includes the source documentation tool, spatial data acquisition tool, and the field verification application. The data are published in the map portal of the NHBP, which is our visually attractive answer to grey polygons, lines and points specified by INSPIRE. The concept of visualisation of our spatial data in the GIS portal of the National Heritage Board of Poland was created in co-operation with Warsaw University of Technology. The project began with the analysis of existing paper maps and map portals on monuments in terms of cartographic signs and symbols, as well as the resulting legibility of the maps. The results were the basis for conclusions regarding the classification of objects and the reference data; good practices were also identified as a prospective basis for visualisation of the data and the creation of the coherent system of icons. We wanted to keep the map legible and achieve the resemblance to paper atlases of monuments. The criteria were set for the symbolisation of monuments (type and chronology in the case of archaeological monuments) and the symbols for general categories of monuments: registered monuments, UNESCO World Heritage Sites, monuments of history, archaeological monuments, and other immovable monuments. For the first three we applied already existing symbols. Basic map compositions (including the reference data) were also prepared. The next step was to discuss the aggregation of objects and visualisation of the data in scale ranges. As a result the icons are first aggregated to administrative units (voivodeships, provinces, communes). On the level of localities the symbols appear by the name of a city, a town or a village. When zoomed in, they appear in the actual location of a monument. At the moment, there are three profiles for the presentation of monuments: monuments, immovable monuments and archaeological monuments. The first one, including all types of object, is the default setting. Initially, the authors of this concept argued for abandoning the general profile, because of too many different icons disturbing the clarity of presentation. For us, the archaeologists, it was unacceptable from the point of view of heritage promotion and education on archaeological monuments and their significance for cultural heritage in general. 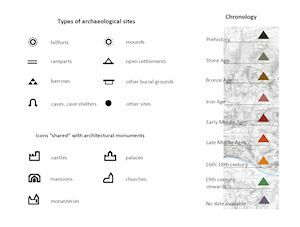 In order to reduce the number of icons, we decided to distinguish only the most important sites or the ones that are the most attractive for non-professional users: hillforts, mounds, ramparts, settlements, barrows, other burial grounds, and caves. 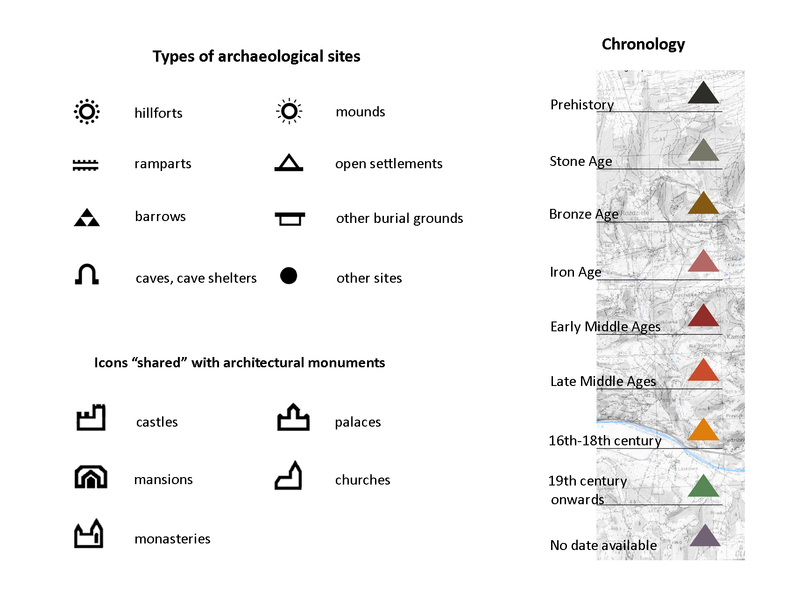 The remaining sites are marked with an icon for 'others' (Figure 3). Just as in the case of general symbols, we used symbols from older printed atlases where possible. In cases where monuments were both architectural and archaeological (castles, or their relics, palaces, mansions, churches and monasteries), two icons represent one monument on the map in the general profile. One is filled and the other – for archaeological monuments – is an outline (Figure 3). Numerous discussions were related to the set of colours for denoting chronology regarding whether there should be a common time scale for archaeological and other monuments. We finally opted for such a solution, so that it was clear to the users of the portal that a church or a castle had functioned at the same time as a hillfort or a settlement registered as an archaeological monument. The issue of data sustainability makes any digitisation project a never-ending story. We need to keep adding new sites as they are entered into the register. We should not forget about regular reviews of the thesauri, so that the metadata are similarly accurate for all the resources. In order to keep the data secure our digital environment is fully virtualised with full server backup, and the digitised source documentation is stored on a server in an outer data centre (Kołodziej 2012, 126). The field verification project is almost finalized, and the database has already been completed with approximately 90% of the resulting data. Internal legal analysis of our archive has recently shown that within INSPIRE we should also digitise the entire Polish Archaeological Record. Legal opinion from November 2015, concerning the legal status of the record of monuments, was to establish whether the monuments included in the AZP belonged to the theme of spatial data mentioned in the Act of 4 March 2010 on spatial data infrastructure – Protected areas (Rada Ministrów 2010, Art. 3, par. 7, pt c). The analysis demonstrated that the above-mentioned provision referred also to part or all of a property, or the complex of property fitting the definition of a monument, as understood in the Act on the Protection of Monuments and the Guardianship of Monuments from 23 July 2003 (Sejm Rzeczpospolitej Polskiej 2003, Art. 3, paras 1 and 4), and not only the monuments covered with four forms of legal protection listed in that act (see section 3). Digitisation of the Polish Archaeological Record is a pressing need, hence the positive, even enthusiastic response from the NHBP archaeologists. The only shadow is cast by our fear of giving the detectorists easy access to information on archaeological sites. At the moment the NHBP is trying to obtain funding for this huge project. The present state of our portal and the underlying repository leaves many options for system development. We definitely need more levels of access, because regardless of the visually enjoyable presentation of the data, the portal in its present state is suitable only to 'naively query and view protected sites' (INSPIRE 2010, 67). According to the data specification, such a scenario is typical for 'non-expert/public user' searching for information regarding local, regional and Europe-wide context (INSPIRE 2010, 67). A portal without language versions other than Polish does not fully meet their needs. Higher levels of access (Figure 4) require the download option for the source documentation. To introduce such functionality we have to mask personal data in all the documents regarding all types of designation, which is one of the biggest challenges for the immediate future (Kołodziej 2012, 126), and it has to be done within the INSPIRE timeframe. In the meantime, the source data and the full version of the portal (containing ranges of archaeological sites instead of popular icons) should be made accessible to other authorised users, such as employees of Monuments Protection Offices and the Ministry of Culture and National Heritage. For the sake of current heritage management we must think of introducing an online system of editing and verification of new data, so that the decisions on paper and books of register written with four colours of ink were only an addition to an otherwise fully functional digital system. Development towards the interaction between professionals creates an opportunity for a wider social involvement; e.g: let us imagine dog walkers reporting threats to their local heritage. Some of the possible directions for the development are required by INSPIRE and are on the way, others are still on our wish list, but all of them are necessary for heritage management in an open information society. Bielawski, B., Kołodziej A., Olszewski, R. & Gotlib, D. 2013 'Wykorzystanie BDOT10k do tworzenia zbiorów danych zgodnych ze specyfikacjami dyrektywy INSPIRE' in D. Gotlib and R. Olszewski (eds) Rola bazy danych obiektów topograficznych w tworzeniu infrastruktury informacji przestrzennej w Polsce, Warszawa: Główny Urząd Geodezji i Kartografii. 141-55. Fiedukowicz, A., Głażewski, A., Koszewski, K., Kowalski, P. J., Latuszek, K., Olszewski, R. & Włochyński, L. 2014 Opracowanie koncepcji i realizacja wizualizacji kartograficznej zabytków w portalach informacyjnych NID. Raport końcowy, Unpublished report. Kołodziej, A. 2012 'Wykorzystanie danych referencyjnych oraz usług danych przestrzennych w projektach informatycznych dotyczących popularyzacji dziedzictwa narodowego Polski', Roczniki Geomatyki [Annals of Geomatics] 10(4), 119-32. Kołodziej, A. 2013 'Zasilanie systemów dokumentacji obiektów zabytkowych' in D. Gotlib and R. Olszewski (eds) Rola bazy danych obiektów topograficznych w tworzeniu infrastruktury informacji przestrzennej w Polsce, Warszawa: Główny Urząd Geodezji i Kartografii. 264-76. Sejm Rzeczpospolitej Polskiej 2003 Ustawa z dnia 23 lipca 2003 r. o ochronie zabytków i opiece nad zabytkami, Dz. U. 2003, no. 162, item 1568.